The term ‘collateral damage' has recently been added to the vocabulary of military forces to refer to the unintended consequences of armed interventions, consequences that are unplanned but nevertheless damaging and often very costly in human and personal terms. But collateral damage is not unique to the world of armed intervention - it is also one of the most salient and striking dimensions of contemporary social inequality. The inflammable mixture of growing social inequality and the rising volume of human suffering marginalized as ‘collateral' is becoming one of most cataclysmic problems of our time. For the political class, poverty is commonly seen as a problem of law and order - a matter of how to deal with individuals, such as unemployed youths, who fall foul of the law. But treating poverty as a criminal problem obscures the social roots of inequality, which lie in the combination of a consumerist life philosophy propagated and instilled by a consumer-oriented economy, on the one hand, and the rapid shrinking of life chances available to the poor, on the other. In our contemporary, liquid-modern world, the poor are the collateral damage of a profit-driven, consumer-oriented society - ‘aliens inside' who are deprived of the rights enjoyed by other members of the social order. 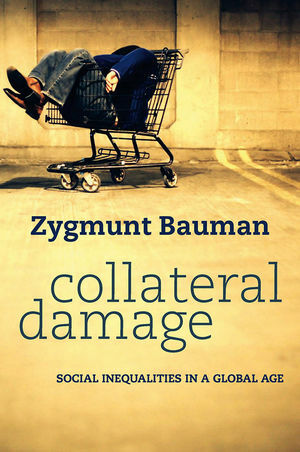 In this new book Zygmunt Bauman - one of the most original and influential social thinkers of our time - examines the selective affinity between the growth of social inequality and the rise in the volume of ‘collateral damage' and considers its implications and its costs. Zygmunt Bauman (1925-2017) was Professor Emeritus of Sociology at the University of Leeds, UK. He is the author of many books that have become international bestsellers and have been translated into more than thirty languages, including 44 Letters on the Liquid Modern World, Liquid Times, The Art of Life and Living on Borrowed Time. "Catalogues the almost irreparable damage and corruption visited on the fabric of humanity and its collective values of solidarity, as well as shared interests, by the practices of modern capitalism." "A wise old man, raging against the rise of new evils and yet retaining a passion for a redemptive and transformative mission for sociology and its concerns, is something laudable." Zygmunt Bauman is one of the most original and influential social thinkers of our time. This new book focuses on social inequality. Poverty is often seen as a problem of law and order, but this obscures the social roots of inequality, which lie in the combination of a consumerist life philosophy and the shrinking life chances available to the poor. The poor are the collateral damage of a profit-driven, consumer-oriented society - they are ‘aliens inside’ who are deprived of the rights enjoyed by other members of society. This book represents a significant new advance on Bauman’s previous writings on liquid modernity. Here he confronts systematically and for the first time the phenomenon of social inequality in our contemporary global age. Bauman has a large following and his books are widely read outside of higher education. This book will also appeal to students in sociology, politics, cultural studies and related subjects.